Ingredients: Sodium Bicarbonate, Cream of Tartar (Tartaric acid), Sodium LaurethSulfate, Lauryl Betaine, Perfume, Cocamide DEA, Cinnamon Leaf Oil(Cinnamomum cassia), Clove Leaf Oil (Eugenia caryophyllus), SandalwoodOil (Santalum album), Cinnamon Powder (Cinnamomum cassia), *Eugenol,*Cinnamal, *Benzyl Benzoate, *Limonene, Linalool. *Occurs naturally inessential oils. Vegan. Lush description: When Lush first started out, it arose from the ashes, if you will, of the founders’ former company, Cosmetics to Go. We had a competition for a new name. Naturally loads of people chose Phoenix but most of them spelled it Phoenix. at was this bar’s name for a while until Auntie Pamela just couldn’t stand it any longer and corrected it while no-one was paying attention. This Bubble Bar is helps you to arise from the ashes of your bad behaviour to return, refreshed to your normal self the next morning. Warming, reviving cinnamon and sandalwood help your brain to switch itself back on again. It smells rather like a cinnamon bun so don’t leave it in the kitchen. Now get the coffee on and have a bath. For mornings when you wish your brain had an ‘on’ switch. Review: Ohhh…When the “Phoenix” bubble bar is dry it smells sort of like a cinnamon roll, with some cloves added. But then, in addition comes the calming scent of sandalwood (I love sandallwood). When you smoosh the Phoenix in the water, the sandalwood scent comes in behind the cinnamon/clove scent. . What a great combination; cinnamon, clove and sandalwood. It’s a bit spicy with the cinnamon and clove, and a bit incense-y with the sandalwood. I absolutely love this bubble bar. The scent is as if Floating Island and Skinny Dip had a baby. The smell doesn’t last once in the water for more than 10 minutes. But boy what a yummy 10 minutes. I think if I had a Floating Island bath melt, the combination would be heaven. Even though the Phoenix bubble bar’s scent isn’t as strong as I’d like, I’ll still give it 4 stars because it is so different and great smelling. I would put Phoenix on my “Top Ten Lush bubble bars of all time” list. Notes: I had a second Phoenix bubble bar tonight and I added a Lush Phoenix bath melt that I had saved. That’s what I call a “one timer” cocktail. 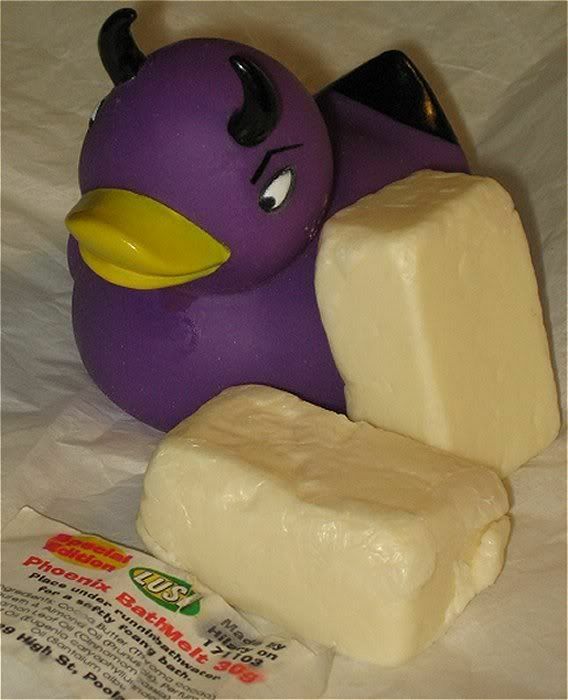 The Phoenix bubble bar and melt were great together, the melt has almond oil in it so it was a nice combination for my skin too and the scent was just right, amped it up a bit. But try a Floating Island with the Phoenix bubble bar if it’s not as strong as you would like, the Floating Island adds some more sandalwood to the sandalwood already in Pheonix bubble bar, and the creaminess of the FI, makes the whole Phoenix cinnamon/sandalwood thing even creamier and yummier. Posted on April 8, 2016 by Lushalot	• This entry was posted in Bubble bars and tagged lush phoenix bubble bar. Bookmark the permalink.